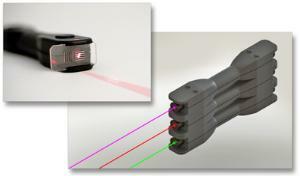 This laser box educates students about light, lasers, and photonics. Blox are a safe and engaging tool to help students learn the fundamental principles and applications of one of the most exciting technologies today. The Blox's magnetic surfaces allow the Laser Blox to be placed on a whiteboard or stacked on top of one another, and a removable plate allows the laser to be transformed into a line laser ray for easy optics investigations. Use three Laser Blox of the same color to create a ray box, or stack three different colors to demonstrate the properties of various wavelengths.